works! after a week or so all of a sudden you notice growth! 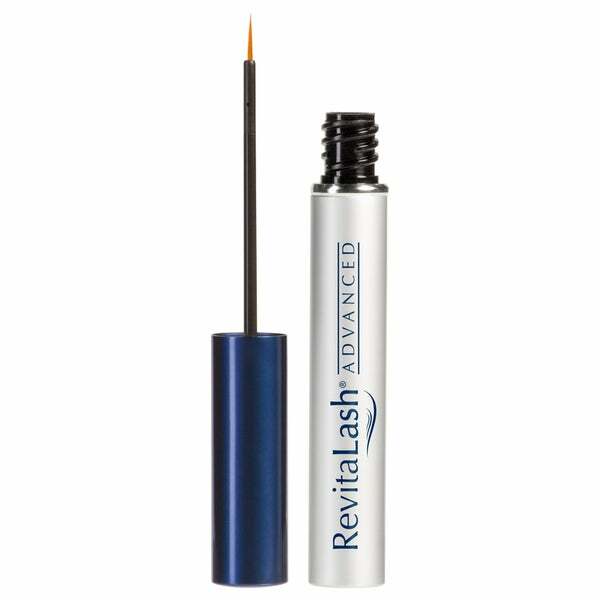 RevitaLash Advanced is a finely calibrated, scientifically driven cosmetic formula developed to address the visual signs of eyelash aging and stress. RevitaLash Advanced features the company's proprietary Biopeptin Complex, a breakthrough cosmetic technology. Combined with potent antioxidants and fortifying amino acids, it works in concert to enhance the beauty and create the impression of iconic-looking lashes. Features and benefits: - Conditions the eyelashes to help protect from brittleness and breakage. - Helps improve flexibility, moisture and shine. - Helps defend eyelashes from daily aggressors. - Enhances the appearance of beautiful, younger-looking, more luxurious eyelashes. - High impact BioPeptin Complex, peptides and botanicals saturate the lashes with moisture, keeping them soft, luxurious and healthy-looking. Dimensions 0.25 In. X 0.25 In. X 3.0 In. I am amazed at how well this product works. My eyelashes are long and beautiful! I have been using RevitaLash for about 3 weeks. After just a few days I noticed my eyelashes looked better- I can't really describe how they looked better other than to say that they were more conditioned and healthier looking. I have noticed in the last few days that my lashes look thicker. Also, I feel that my mascara goes on much more smoothly and my eyelashes look great with mascara. I am excited to see how it works as I continue to use it! This is the greatest invention for those who have scant or short eyelashes. I used to have very long eyelashes, but with age they got shorter. This has made them grow longer again, and I only need to use it two to three times a week. Ladies, there is hope! I've been using this product for a couple of years. I also use the Jan Marini, but I like this one best and was happy to see it on overstock. They have the best price. Have used Revitalash Advance for over three years. I am a over 60 years old and my lashes were few and far between. I started with Latisse, but my eye doctors did not recommend. I tried other less expensive products, but was not satisfied. Just to clarify make sure you purchase Revitalash Advanced. My 30 year old daughter has now started using Revitalash Advance and she is getting better results than I have had. My recommendation; make sure your eye lashes are very clean when you apply. Love this product. Best Eyelash Conditioner ever!!!! I recommend RevitaLash 2ml Advanced Eyelash Conditioner. This lash enhancer works beautifully. It is very easy to apply, and I definitely notice a difference in length and fullness of my eyelashes after continual use. It definitely helps thicken lashes. My eyelashes look fab now that I have used this product! I had eyelash extensions that ruined my normal lashes, this made them grow back long and beautiful! This stuff is like liquid gold! It amazes me how long my eyelashes are. As soon as I turned 40 they started thinning and falling out due to hormones and stress, I never thought I would get them back. I always had long think lashes. I love using this on them it has given me my lashes back. I’ve been using it for almost 2 years. It doesn’t irritate my eyes like other expensive brands but once in a while my eyes do feel dry. I just won’t apply it on those days and it helps. It does take a few weeks until you notice a difference, but it’s so worth it!! This is one of the few eyelash enhancing formulas which actually WORKS!! Both my daughter and I have tried a number of different brands and we have both settled on RevitaLash. It does not necessarily thicken your lashes, however, it does facilitate lengthening. Cannot order on Amazon Prime - if you live in California - for some strange reason but Overstock offers it at a reasonable price and ships quickly. I have used a few lash serums, this one is the best! Much better than latisse, less irritating and better results. I read several reviews before purchasing, and am happy with the results. I don’t usually have issues with eye products and I don’t have sensitive skin but after a couple of days this caused my eyes to be extremely itchy and irritated. I stopped using the product and it still took about a week to ten days for the itching to stop. Unfortunately this product isn’t returnable so I had trash it. I have used the regular revitalash in the past and found it worked and didn’t cause the itching this advanced formula caused. I have been using this for years. Everyone thinks my lashes are fake. I've tried WooLash, Rodan & Fields, Latisse and others. this is by far the superior product. I use it everyday for a week then taper down to 1-2x per week. Overstock has the best price. Reccomend this product to anyone .ARRIVED AS NOTIFIED. mY LASHES LOOK HEALTHY. I've only noticed a little difference, but I'm trying to be optimistic. I try to remember to use it every night, but I'm not always successful. I read great reviews of the RevitalLash on several different websites but it did not seem to work for me. Used faithfully every night before bed for six weeks, with little results. Gave the item a 3-star review because Overstock had the best price I could find. If this is an item that works for you, Overstock is the place to buy it. It really works... be patient. It’s not magic, it’s science. I’ve since true neulash but back to but this again.. found the results far more superb. Question if anyone knows what the difference is between this product and the Vlumew..? "are you an authorized retailer for revitalash?" no. I did some research and found this was one of the best products (that was still relatively affordable). "I received a product that has the batch code "N13J31". I am concerned that it might be a fake because "J" in the batch code represent September. Yet there is only 30 days in September." Hello emilyccc, Overstock.com stands behind every product we sell. When necessary we can contact suppliers if a product issue arises. Thank you for shopping with us. I've been using this product of two years. It is amazing!!!! "I would like to see a full product ingredient list for the actual item that will be shipped. There are a couple versions of this product and I want to know if the one I will receive has the essential ingredient "isopropyl cloprostenate"." Hello garnet6106, the active ingredients are Water, Serenoa Serrulata Fruit Extract, Panax Ginseng Root Extract, Dechloro Dihydroxy Difluoro Ethylcloprostenolamide, Biotin, Camellia Oleifera Leaf Extract, Swertia Japonica Extract, Biotinoyl Tripeptide 1, Octapeptide 2, Calendula Officinalis Flower Extract, Triticum Vulgare (Wheat) Protein, Phenoxyethanol, Chlorphenesin, Glycerin, Cellulose Gum, Butylene Glycol, Phosphoric Acid, Disodium Phosphate, Pentylene Glycol, Thank you for shopping with us! a.c.